John Katsilometes having fun with singer Wayne Newton at a taping of “Who Wants to be a Millionaire” at Caesar’s Entertainment Studio in May, 2017. Corralling columnist John “Kats” Katsilometes for an interview is not easy. He agrees; he’s busy; weeks go by; he sets a date; he’s called out-of-town; he sets another date; he’s jammed. 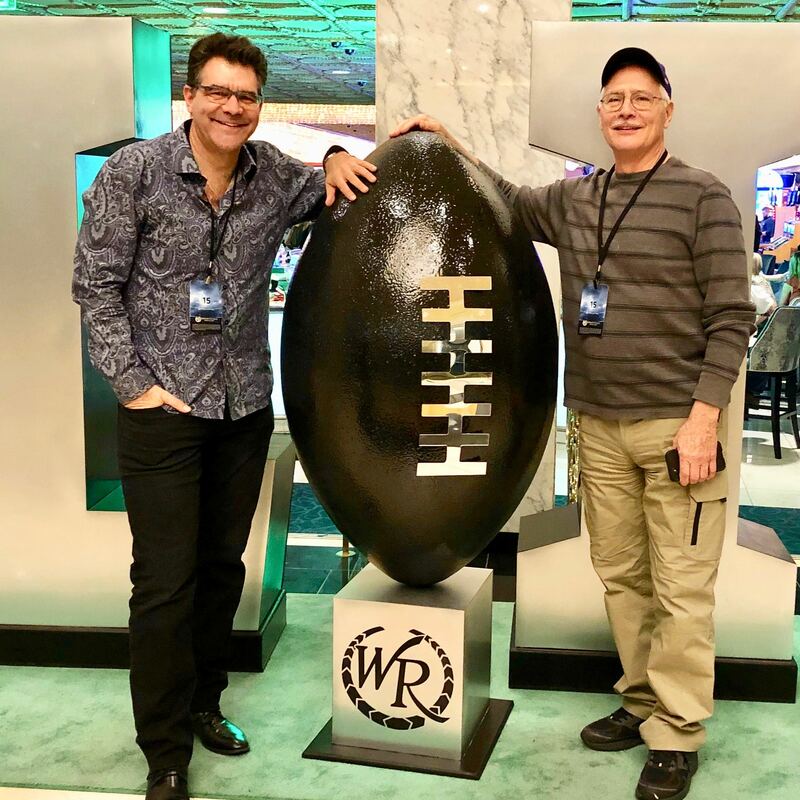 But finally, Kats, the writer and Las Vegas Review-Journal columnist whose third-page column is a must-read for entertainers and the entertainment audience in Las Vegas, sits down for an interview. Kats says he has the best journalism job in America. Kats was also once fired by the very newspaper that employs him today. 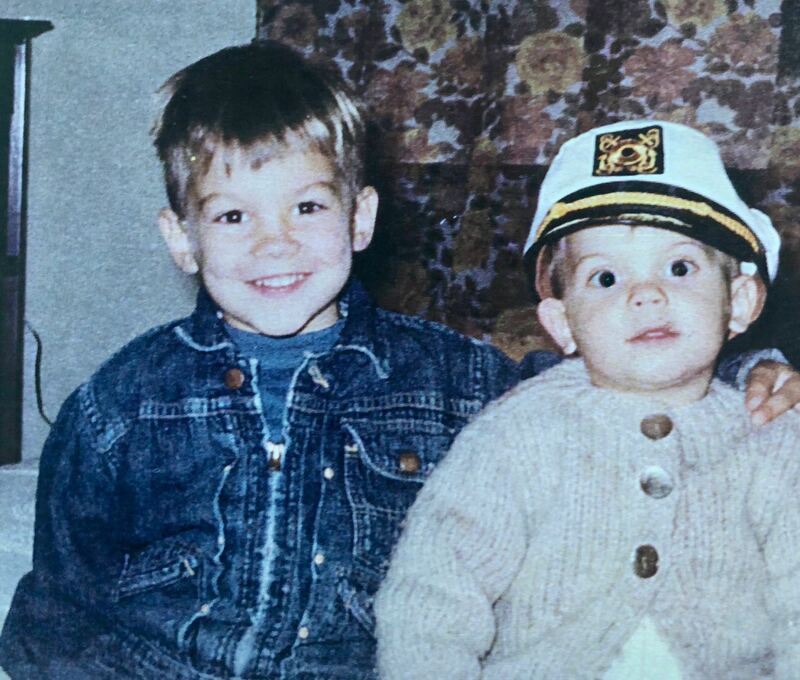 Heritage…Kats and his brother Bill were born in Pullman, Washington and spent their early years in Pocatello, Idaho. Their heritage is Greek on their father’s side and Italian on their mother’s side. While the family lived in Pocatello, Kats’ father was a veterinarian, and his mother managed the clinic. The Katsilometes boys, John (left) and Bill. They would spend their early years in Pocatello, Idaho. Photo courtesy of John Katsilometes. A teacher’s influence… At St. Anthony’s Catholic School in Pocatello, teacher Marcia Kennedy liked to spring five-minute writing exercises on her sixth grade class. Students could write about any subject. Young Kats found he really enjoyed the challenge of those exercises and began mentally banking subjects for the next surprise essay. Years later in Las Vegas, Mariah Rivera of the “Fantasy” show at the Luxor Las Vegas told Kats she thought her aunt had once taught him in grade school. “That’s impossible,” Kats said. “All of our teachers were nuns except for Miss Kennedy.” Miss Kennedy is Mariah’s aunt. Her exercises taught Kats that he had a talent for writing. 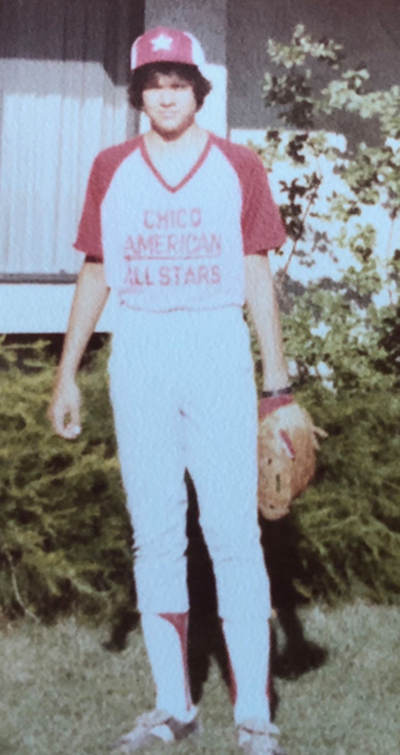 Kats was a long and lean baseball and basketball player in Chico, CA. An Opportunity … Kats loved his sports and writing activities, but admits he had little interest in other subjects and was not a particularly good student in high school. Upon graduation in 1984, he took three months off to delay any decisions about future education. He went back to Pocatello to be with his grandmother because his grandfather was very ill. The first week after returning to California, Kats ran into David Little, a reporter who had covered Kats as an athlete in high school. Little told Kats about a job opening at his paper; Kats interviewed on a Thursday and was covering local sports by the following Sunday. He was 18 years old. 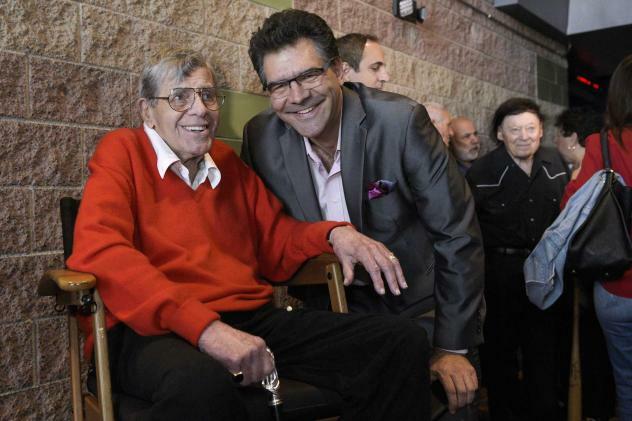 Kats and the late Jerry Lewis following Lewis’s final performance at the South Point Showroom Oct. 2, 2016. Kats may make as many as four stops around Las Vegas in a night. 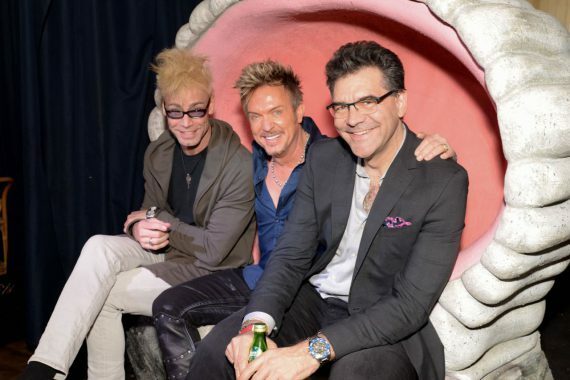 Here he is with magician Murray Sawchuck and Chris Phillips of Zowie Bowie at the Golden Tiki on February 7. The Sun…Eventually, Kats learned the competing newspaper, the Las Vegas Sun, had an opening for a feature writer. Kats needed to work, so he took a job writing about lifestyle, arts and entertainment. He also began turning his life around. He stopped drinking and became involved in 12-step work. As he said, “I started to take myself seriously.” At the Sun, he worked hard to establish a good track record. “I wrote good stories,” he says. He was eventually named Associate Editor of his section, and then spent six years as Features Editor. At one time, 12 staff and freelance writers reported to him. 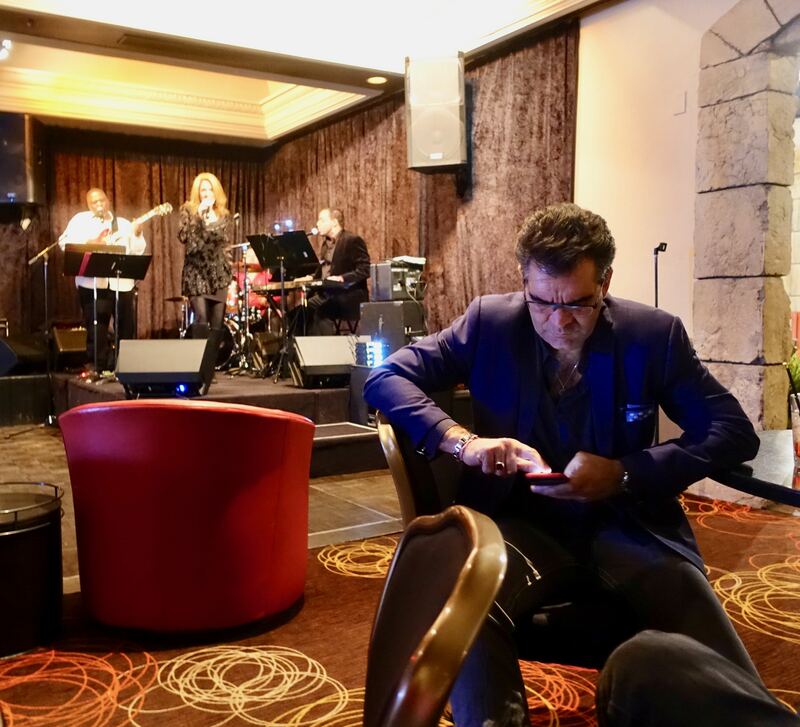 Kats’ phone is his lifeline to breaking news –and he doesn’t miss much, even during a Kelly Clinton performance at the Tuscany Suites & Casino. Back to the R-J…The success of Kats’ column drew the attention of the Review-Journal. At the time, the R-J’s entertainment columnist, Norm Clarke, was (and still is) a friend. When Clarke stepped down to pursue other interests, the Review-Journal made a good offer, and Kats was ready to make the move. Kats and his father, George Katsilometes, at the Westgate Las Vegas for Super Bowl Sunday. Tools of the Trade … Kats does all his work with an iPhone 10, which he says is “great for photos and video.” He also carries a small Sony tape recorder and a Mac Book Air laptop. He is meticulous about charging his devices every evening. Kats has a work space at the Review-Journal, and he drops in a couple times a week. 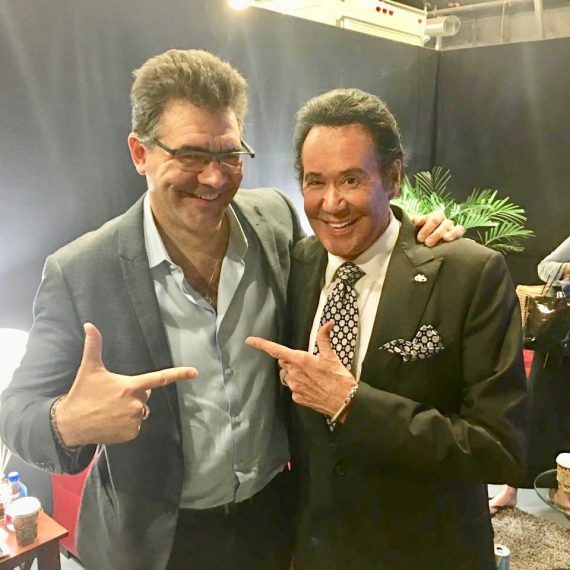 It’s plenty, he says, because “news does not break at the office.” Kats primarily does his work on the run in Las Vegas—or Los Angeles and other nearby locations—or at home. The No Degree Ladder…Kats knows his story as a journalist who came up the ladder without a college degree is unusual. He says he’s not proud of lacking a college background, nor is he ashamed of it, but he does not recommend it. His parents have learned to accept his unusual story, though Kats’ father still says there is time to return to school. Kats could claim that his parents have enough degrees for all of them. Kats’ father, George, who currently owns the Lava Hot Springs Inn in Lava Hot Springs, Idaho, has a bachelor’s degree in zoology from UC Berkeley, a doctor of veterinary medicine degree from Washington State University and a Ph.D. in endocrinology from UC Davis. Kats’ mother, Kathleen Sanna, has a master’s degree in speech-language pathology from Idaho State University. 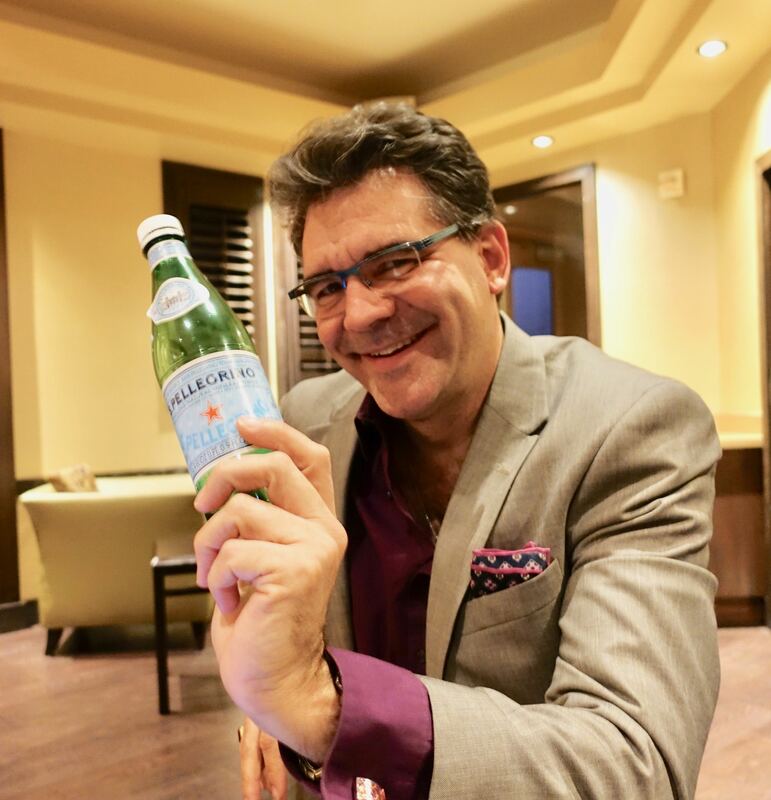 Kats often takes photos of his favorite drink, Pellegrino “fizziwater”. About the Drinking… Kats is out almost very night where liquor is being served, but he does not drink alcohol—ever. He calls what he does drink “fizziwater,” an expression he learned from local entertainer Anne Martinez who once hosted Kats for an in-town Thanksgiving dinner. When he asked what he should bring, she said, “Bring whatever you want to drink.” Normally that would mean bringing bottled water, but Kats got fancy and brought some Pellegrino sparkling water which Martinez calls “fizziwater”. The name stuck. Sometimes when Katz gets really wild, he adds cranberry juice to his fizziwater. Marriage? … Kats was married to Adrienne Packer, a fellow journalist, from 1998-2003. Kats and Packer are still good friends. As for current relationships, Kats admits the velocity of his current life makes relationships difficult—though not, perhaps, impossible. Every entertainer (or former entertainer) in Las Vegas will find his or her way into Kats’ columns, Here he is with former stripper and still stunning redhead Tempest Storm. Why so Busy..Over the years, Kats has learned that people who feel they haven’t lived up to their potential or wasted part of their lives develop a yearning to make up for lost time. “I think that’s happened to me,” he says, “and it’s why I keep such a full schedule”. On the job.… Kats virtually never has to pay to attend a show or event in Las Vegas. He does have to pay for parking at some of the venues, and he’s been known to take Uber, but he gets reimbursed for those expenses. When Kats is out on the town he is working, which some people don’t quite understand. They ask him for tickets as if he’s a broker or just a fan attending various shows for fun. No, when Kats is out in Las Vegas, he’s working, as evidenced by the many print mentions of shows or events he’s attended or people he’s met. Personal Stuff…Kats lives in an apartment in the Arts District in downtown Las Vegas. He rarely eats at home other than having coffee and cereal or oatmeal for breakfast. He works out several times a week, mostly at his residence but sometimes at the Las Vegas Athletic Club. He drives a 2018 Infinity Q50 with a JKATS license plate. He is nearsighted and first got glasses about 15 years ago. A different assignment: reading “The Nutcracker” to children at The Smith Center in November. More Personal Stuff… Kats is somewhat of a clothes horse and makes a point of looking professional when he is working. His height—6’3”—means he cannot go many places without being recognized, so he’s no Oscar Madison. He typically chooses tailored sport coats and suits, and was wearing a cool suit, shirt and pocket square the evening of this interview. Katz collects old typewriters and recently tried typing on one of his old machines that is still in good condition. He says the typing was much more difficult than he anticipated compared to today’s touch keys. TV occupies just a small part of Kats’ free time, but he likes Jerry Seinfeld’s “Comedians in Cars Getting Coffee” on Netflix and “Schitt’s Creek” on POP (which he records). He’s also a fan of John Oliver’s “Last Week Tonight” and “Real Time with Bill Maher.” He turns on CNN when he wants background news. What’s Next…Kats would like to expand his writing to what he calls “new meaningful subjects.” He’d like to travel more. He’s planning someday to write a book (he’s currently collecting material). He would also like to solidify his Las Vegas reputation. Growing up, Kats admired San Francisco Chronicle columnist Herb Caen, whose column seemed to epitomize San Francisco. Kats hopes that someday his name will be linked in the same way with Las Vegas. Nice article and background about Kats. John is a hard-working pro, it’s pretty rare for us to be on the Strip at events and not see him. And in the small world department, when we were living on the road, 1994 to 1999, Lava Hot Springs was one of our favorite go-to places. Happy Birthday Kats! Love the title! Diane is always good for charming and quirky stories. Thank you for sharing your interview. I learned so much and, he’s lived a very interesting and impressive life. Excellent article Diane. It was long and detailed but kept my interest to read more. Found it interesting being sports writer and finding his niche in entertainment. Thank you, Diane, for your wonderfully informative article about this intriguing man who tells us so much about others, but who, up to now, has been somewhat of a mystery man. As always, Diane, a great article. Trust you to be able to turn the key to what makes a person who they are. I really enjoyed reading about him. Diane Taylor does a great job providing full details on Kats. Mention of Kats going back to his newspaper to write a late night piece to fill a hole in a page reminded me when I did the same around midnight so readers could see a review next morning. 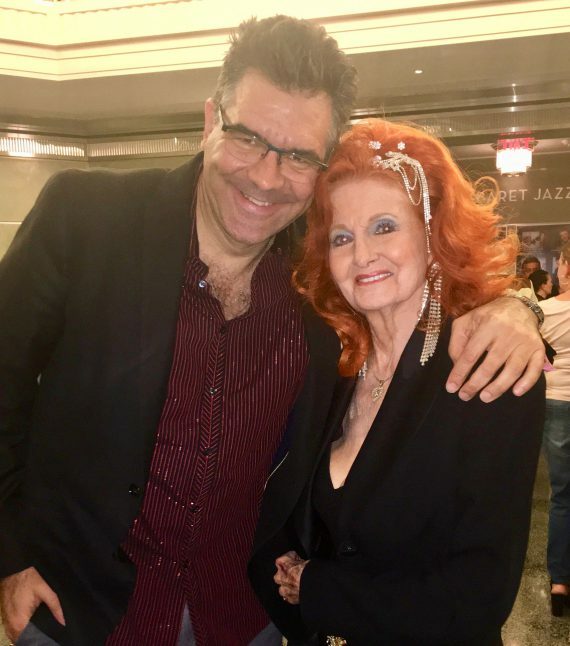 The photo of him with former stripper Tempest Storm brought back memories of the time I covered top stories of the day: Measurement of Tempest Storm’s bust for a $1 million insurance policy. I am touched! Thanks for the kind words, John. Sounds like those writing exercises weren’t a com0lete waste of time! Such a nice article and a great way to learn a bit more about the person you’ve become. 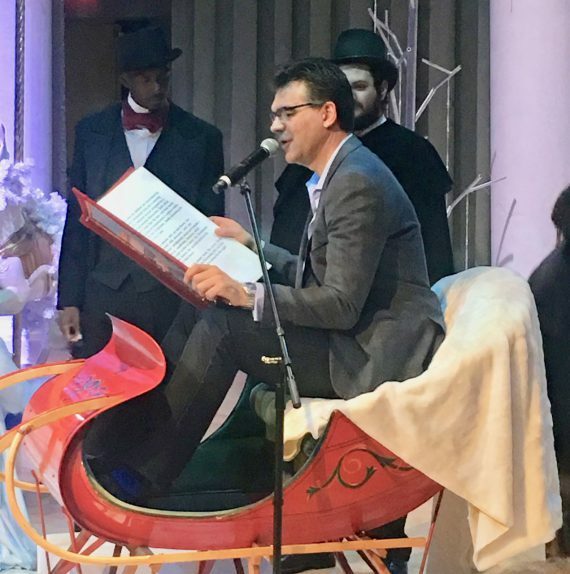 John wrote a column on going home to Pocatello at Christmas time. This was several years ago Then he wrote another column a year or so later on the same topic. I had obtained a copy of those columns and I thought I had them saved on my computer. I can’t find either one. Do you have a “past columns” saved spot in your files?? Please let me know and how I could download a copy. Del, as mentioned before, you need to write to Kats direct, address previously provided to you. Or contact the Las Vegas Review Journal newspaper since John doesn’t write for us.